Have you ever sat out on your terrace and wished for something more? 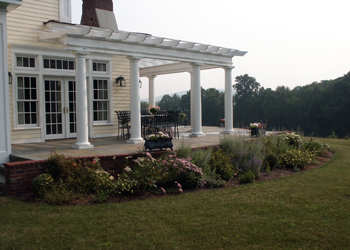 Pergolas and arbors are features which can provide shade to a walkway, passageway, or sitting area. By virtue of their architecture, they can also enhance the beauty of existing structures while further defining outdoor living spaces. Gazebos provide a design element that may include a destination, or an additional outdoor room. The structures can be constructed from a wide range of materials, and sized to fit the site. A featured focal point to incorporate into a new or existing landscape.